Pietà is the last painting by the Italian master Titian (c. 1575). It is housed in the Gallerie dell'Accademia of Venice. The picture represents, over the background of a larger niche in Mannerist style, the Madonna supporting the body of Christ, with the help of a kneeling Nicodemus. 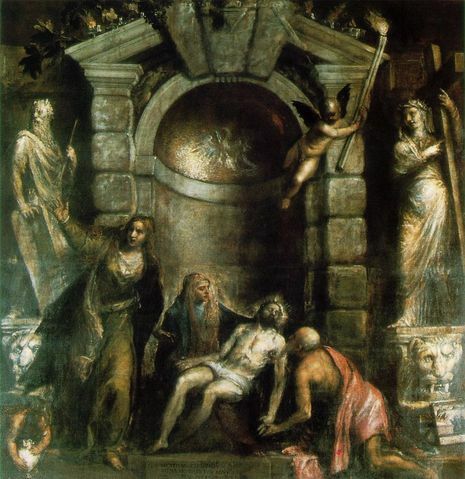 The latter is probably a self-portrait of Titian, represented as if he saw his also upcoming death in the Christ's face. On the left, standing and forming an ideal triangle, is Mary Magdalene. Another small self-portrait, together with his son Orazio, is shown in the base of one of the columns surrounding the niche. 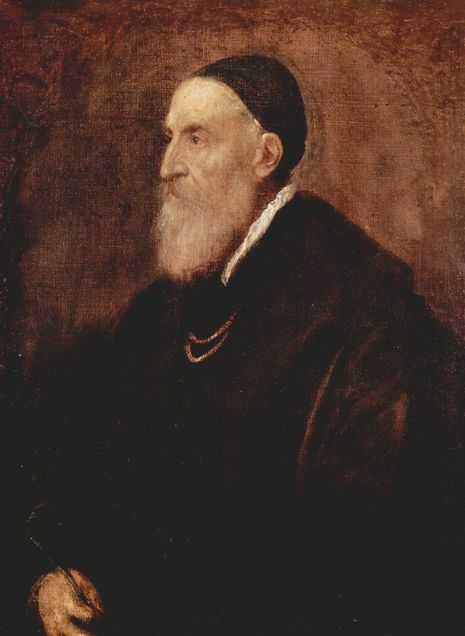 The picture is generally considered Titian's last: an inscription in the lower part of the picture notes that it was finished by Palma the Younger. The dark and mellow colors, and the general unfinished appearance, contribute to give the picture a spectral, disquieting atmosphere. Titian, so quiet about himself and so organised in his professional career, is in reality a powder keg of emotion, artfully channelled but never suppressed; his art is profoundly confessional. The Death Of Actaeon is a confession. And at the end of his life, Titian movingly drops all his elaborate strategies, takes off his Venetian mask and addresses us - and his God - directly in one of the most unguarded paintings anywhere. Only a master of irony could make such a total confession; only a master of colour could make a painting that is so denuded of it: Titian's Pietà in the Accademia in Venice was painted as an ex-voto offering, a prayer, when Titian was very old and when Venice, the city he adored, was being devastated by plague. Titian's Pietà pleads (the text is on a painted tablet) for mercy for Titian himself and for his son, Orazio. Titian puts himself in the painting, an almost naked, bearded old man, pathetically and hopelessly touching the hand of the dead Christ. Light has almost gone from the world - apart from a dull glow on the mosaic above Christ's dimly shining corpse, the painting sinks into reveries of shadow, of death. If you look, you will eventually see what you fear, and in this last painting Titian sees death, his own death. Titian's offering failed; neither he nor Orazio outlived the plague epidemic.